Of course you do! 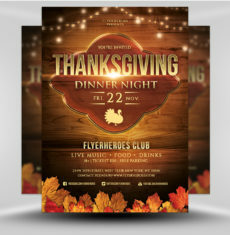 Let FlyerHeroes help you communicate all of the fun details about your Thanksgiving Day celebration. 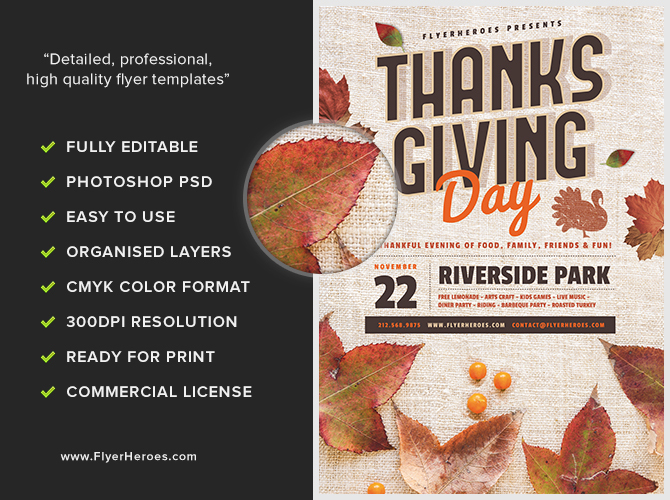 This easily editable template will help you create a stunning, professional-looking Thanksgiving Day flyer in less time than it takes to prep and cook a delicious Thanksgiving dinner. Hand out flyers and mini turkey-shaped promotional items imprinted with your venue’s information. Distribute flyers and candy wrapped with a “thank you” label to office workers during lunch hour. 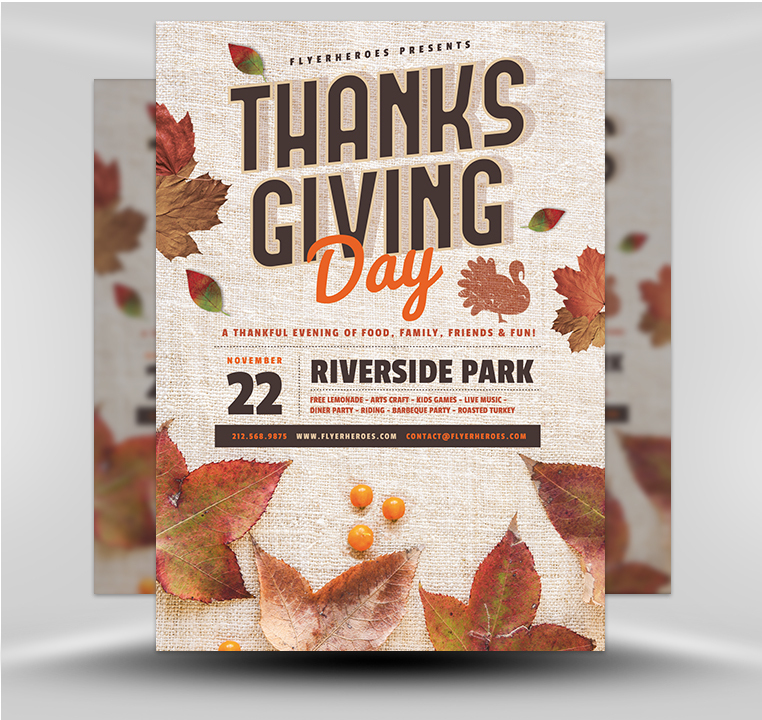 Create a stunning Thanksgiving Day postcard using the flyer’s digital image. Hand it out or mail out via postal mail. 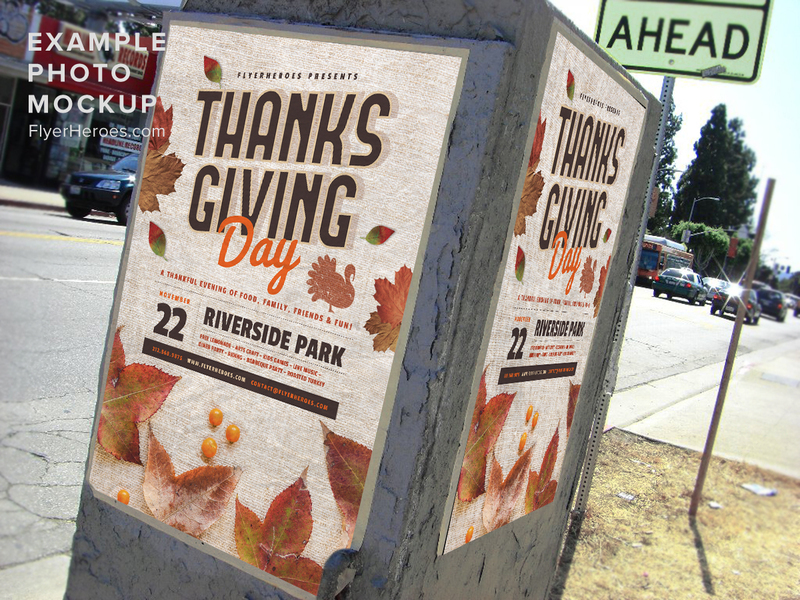 Insert the flyer’s image into local, paid Facebook ads or boosted Facebook posts. Place stacks of flyers in free newspaper boxes in your local area. Pin flyers to bulletin boards in supermarkets, clubs, organizations, and health clubs around town. Ask staff members to distribute flyers to their friends, relatives, and neighbors. Place flyers on the windshields of vehicles parked in residential neighborhoods. Use the flyer’s digital image to run an ad in your local newspaper. 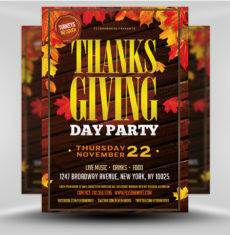 Utilize the flyer’s image in a pre-Thanksgiving Day social media post or blog post. Post giant-sized flyers on bus or train shelters. Dress up a staff member like a Pilgrim and have him or her distribute flyers in front of busy restaurants and shops. Leave stacks of Thanksgiving Party flyers at your local library, laundromat, and other public spaces. 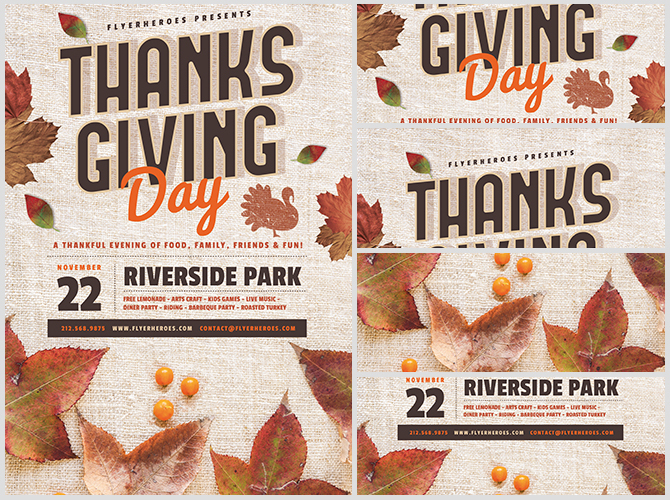 Attach a copy of your Thanksgiving Day menu to the flyer and mail or hand it out to potential attendees. 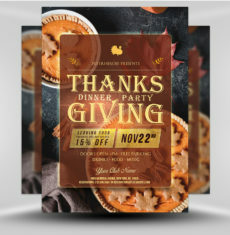 E-mail a promotional Thanksgiving Day newsletter featuring a side dish recipe, a copy of your Thanksgiving Day menu, and a digital image of the flyer.